Michael Williams, author and formerly homeless veteran, in the podcast studio. 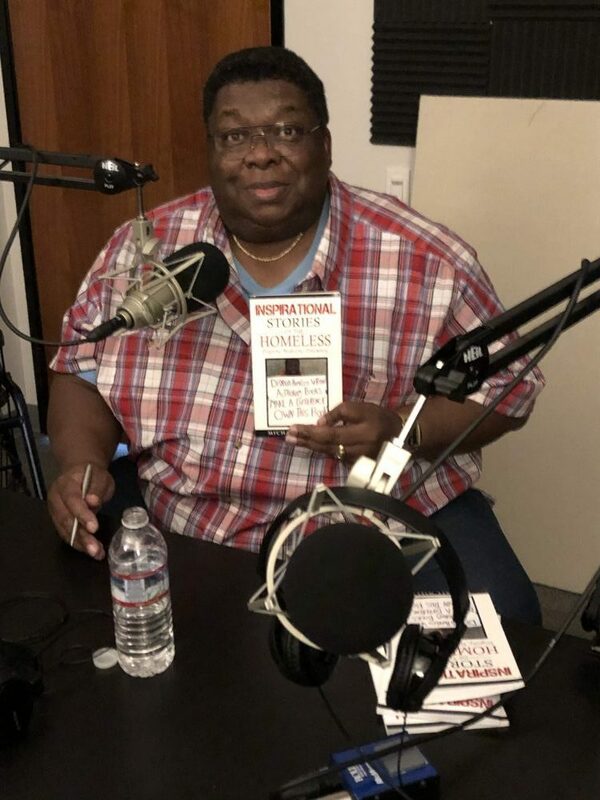 On this episode of ‘Homeless in San Diego: Real People, Real Stories,’ host Greg Anglea, CEO of Interfaith Community Services, welcomes Michael Williams, a published author and formerly homeless Marine Corps veteran. Michael also expressed the spirituality he experienced from homelessness – it deepened his awareness toward the human condition. Beyond mental illness and drug addiction, there are many other reasons people become homeless. Michael is especially grateful for peoples’ help because of the homeless children that are out there that no one talks about. He made a point that there is no certain profile that characterizes how someone ends up homeless compared to another person. There are college students as well as children living on the streets. They are trying to get by, going to school every day, and seemingly leading normal lives. Sometimes, we can never tell who is suffering immensely. Another spiritual aspect of the show was brought up: the flaw in all of us – judging others too quickly. “We don’t know what someone is going through or what leads them to be cranky that day or why they’ve turn to drugs or alcohol to soothe their pain. We don’t know. And so I really encourage our listeners to read some of the stories we share here,” said CEO Greg Anglea. He arrived to his apartment with nothing but the clothes on his back and a duffel bag full of his stuff. He slept on the floor a couple of days, but felt grateful to be indoors. During his adjustment period, he realized there are so many things taken for granted when it comes to living in a home – simple things like our wardrobe, dishes, and a couch in the living room. CEO Greg Anglea and Michael Williams discussed how mental health issues are often not the reason someone ends up living on the street, contrary to popular belief. Michael’s goal is to break apart shallow perceptions and inspire empathy and compassion toward those suffering from hardship. “Very often, many people think that people experiencing homelessness are suffering from mental illness and it is not a contributing factor to their homelessness. They made good, solid, mature decisions; however, they were overwhelmed and they did not have resources to meet the challenge,” said Michael. “If there is a good side to it, from a spiritual basis, it’s made me a kinder, more empathetic, more understanding human being, and less judgmental. Being less judgmental is a true gift of humanity,” said Michael. On this week’s podcast, Michael Williams rejoins us to talk about his stories while experiencing homelessness. Michael is a marine corps veteran, an economist, and an author who experienced homelessness later in life. In the last episode, we learned that Michael endured debilitating health issues, and as a result lost his job and livelihood. This led him to receiving rehabilitation services from Interfaith and eventually being able to rent an apartment. Williams arrived to his apartment with nothing but the clothes on his back and a duffle bag full of his stuff. He slept on the floor a couple of days, but felt grateful to be indoors. During his adjustment period, he realized there are so many things taken for granted when it comes to living in a home such as our wardrobe, dishes, and a couch in the living room. “So the journey of ending homelessness is not ended, it is still a continuous journey that takes years in order for people to get to a point where they can reenter what I would call typical middle class America which I was a part of prior to my illness,” said Williams. Anglea and Williams discussed how mental health issues are not the reason why someone ends up living on the street, contrary to popular belief. Williams’ goal is to break apart shallow perceptions and inspire empathy and compassion toward those suffering from hardship. Williams shared that enduring homelessness caused a tremendous amount of stress, anxiety, and depression which is a condition he suffered from after he found himself in a homeless environment and the reality. Rehabilitation from those experiences may require a period of recovery time based on the traumatic events he encountered from losing his job, home, car, and livelihood. “If there is a good side to it, from a spiritual basis, it’s made me a kinder, more empathic, more understanding human being, and less judgmental. Being less judgmental is a true gift of humanity,” said Williams. He is currently working on his 5th and 6th book to contribute to people’s understanding of how people go on journeys they never expected to have. The more empathy we can have for that, the more human we can be. Michael shared his experience at a shelter where at 10 year old girl that was skinny as a rail was wearing hand me down clothes that did not fit her. Her eyes were filled with sadness and she was tired from a lack of resources available. She looked at Michael and asked, “Mr. Mike, can I have a bagged lunch?” His heart was struck and he gave her two. Williams said when people contribute volunteer effort or make donations toward these programs, we are saying yes to children eating, veterans being rehabilitated, and deepening out humanity. Whether it’s yes to a bagged lunch or yes to resources that provide self-sufficiency, Interfaith aims to lend a hand up for all of those in need.